The Port of Los Angeles was the recipient of two Project Achievement Awards by the Southern California Chapter of the Construction Management Association of America (CMAA) for recently completed port construction projects. The Port of New Orleans and Kansas City Southern (KCS) have announced a new weekly service between New Orleans and Wylie, Texas, relaunching intermodal service to this lane for the first time since 2005. The Port of Oakland Commissioners approved exclusive negotiations with the Oakland A’s in the team’s search for a new ballpark. The Port of Trois-Rivières has completed construction of Dock 9, finalizing the new Breakbulk Terminal. 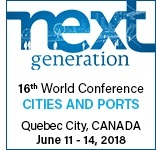 The 16th World Conference Cities and Ports will be a unique opportunity to meet in North America the most influential figures from port cities around the globe, with some 450 delegates from more than 50 different countries expected in Quebec. Dialogue between port and city is essential for promoting economic development in the surrounding territory. Involving citizens in decision-making has become indispensable. These subjects will be at the heart of the discussions at the conference. Fitch Ratings affirmed the 'A' rating on approximately $64.3 million of Canaveral Port Authority (CPA) port revenue bonds. Texas Governor Greg Abbott showed his support for funding Texas seaports, including the Port of Corpus Christi, in a recent letter to Lt. Gen. Todd T. Semonite, Commanding General and Chief of Engineers for the U.S. Army Corps of Engineers (USACE). Port Manatee hosted its third annual Trucker Appreciation Day, providing a free lunch to hundreds of truck drivers. The Port of San Diego is offering free public boat and bus tours of San Diego Bay and its Working Waterfront during May Maritime Month. Broward County’s Port Everglades has entered a Memorandum of Understanding (MOU) with the Port of Limón, Costa Rica, as part of its International Sister Seaport Program. Costa Rica is the port’s eighth largest trading partner by volume. The Port of San Diego and the City of Chula Vista have authorized key agreements that significantly advance the resort hotel and convention center project for the Chula Vista Bayfront.